My Cornish cuties have been in the basement nearly 2 weeks now (I wrote about when I brought them home, in this blog post) and I can’t stand another day, frankly. I started them out in one large box, lined with newspaper and a thick layer of woodchips. Even though I try to look on the bright side (the bright side being, these chicks are certainly producing lots of manure for my new compost pile!) the truth is that it is a lot of work to keep them clean enough to prevent their unique . . . um. . . stinkiness from overpowering the house. Even if I clean out the box every single day, there is an odor to these chicks that does not belong in a civilized home . . . . nay, not even in mine. I get my large cardboard boxes (in which I brood my chicks every spring) from the local appliance store, but sales of large appliances must be slow this spring. I have called and the sweet man there, Ellis, has assured me that I am on his Large Box Waiting List, and I’ve called again and he has assured me so patiently that yes, I am at the top of his list–still–and that he will call me, he promises–but he hasn’t come through this time with a large box for me. Not possessing a very, very large box was a problem, but I did this, instead: I started them out in a medium-sized box that I already had, not a big appliance box, as usual. Within a couple of days, they were crowded, so I cut out one side of that box and added another one to the end, kind of like a spare room. I congratulated myself on this cunning “addition” idea. They spread out a bit and grew some more. Within a few days, the chicks are crowded again, so I cut out a side wall of the addition, and added another box, another spare room. Within a few days they are crowded again. I fret and worry. I’m out of boxes. 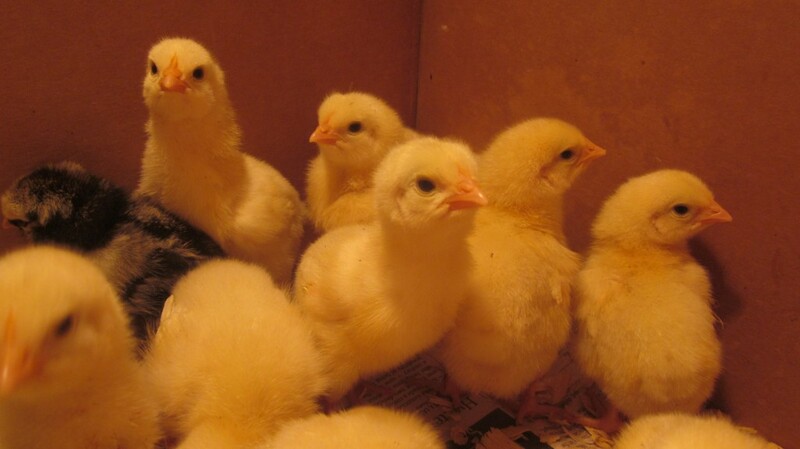 You can practically see these chicks grow if you sit and watch them for a few minutes. Then one night (with no boxes left to add) I sit up in bed with an idea. In the morning, I call my dad. “Don’t you still have some stock tanks that Mom used to use when she raised water lilies?” I ask. So the very next day, my generous and understanding Dad brings over the stock tank I’ve chosen, in the bed of my mom’s pick-up truck, and little Mack and I get to work making it the next home for my rapidly-growing chicks. It needs a spraying out, and then a drying-out, and then it takes me not long at all to line it with newspapers and wood chips, so I can get those stinkin’ chicks out of the house! Mom stuck around to help me, too–to my embarrassment–and I hauled the remaining newspapers and manure promptly out to my compost pile. Phew! What a relief! The house smelled so much better, instantly. 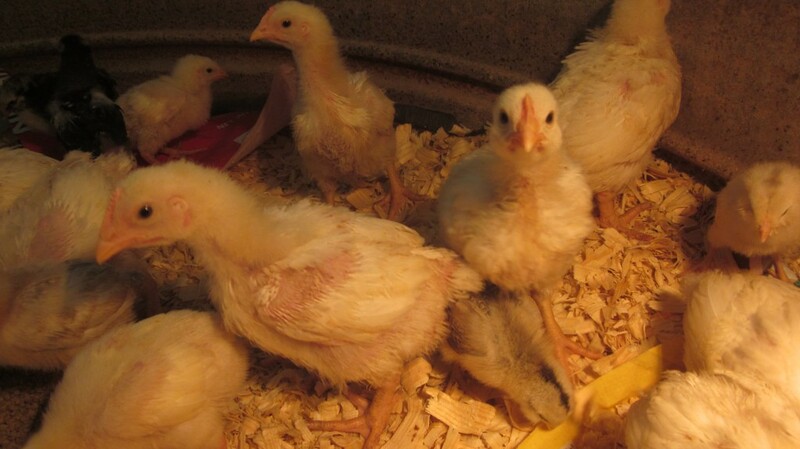 Here are my Cornish cuties just two weeks ago, when we brought them home from the store. Hey Ma, these are nice new digs but you didn’t really have to go to the trouble–all we really care about is the FOOD . . . Here they are today. Check out how they’ve grown! 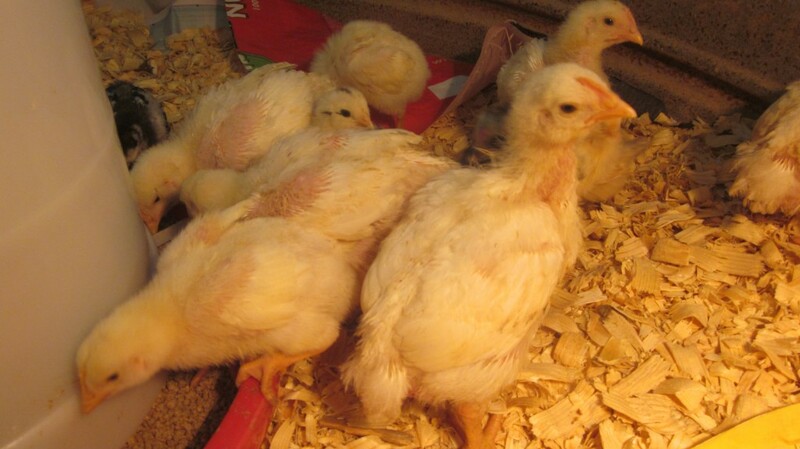 Their baby fuzz is gone, and they are nearly covered with white feathers now. 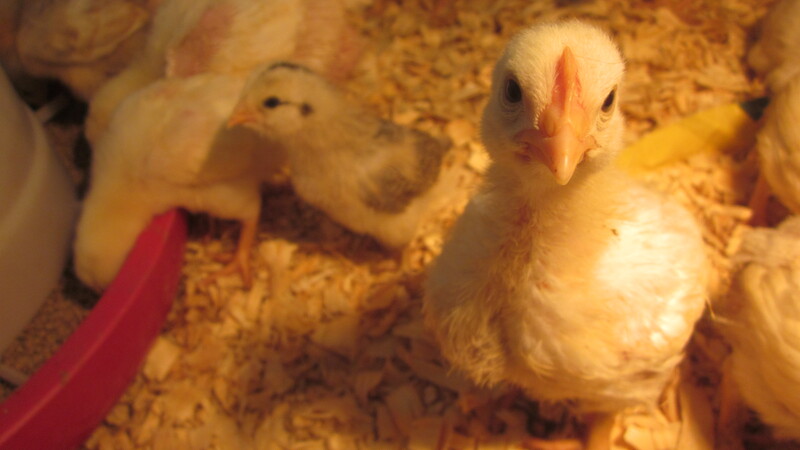 In the background of this picture you’ll see one of my little Americauna pullets. The pullets still are very small, unlike their fast-growing Cornish cousins. Room to breathe, room to move, room to grow . . .
Room for Ollie to watch . . . don’t get too interested, Fella, we all know that you are a bird dog. The chicks will stay in the stock tank in the garage for another week or so, when I’ll move them outside in the PVC and chicken-wire enclosure that Bryan and Timothy made years ago for me. But I have a bit of work in front of me, to excavate it from the brome grass and weed trees where it’s been sitting for the past couple of years . . .
YIKES! Get out the loppers! I’d better get out there now and start pulling and clipping . . . and I just know, now that we’ve gone to all this trouble, that Ellis from the appliance store will call today! Yikes, you’re brave! Don’t think I could have handled the smell for as long as you did! Not brave, Patricia. Maybe a tad stupid . . .
Looks like you have a tad bit of yard work to do there, my friend! Yikes! 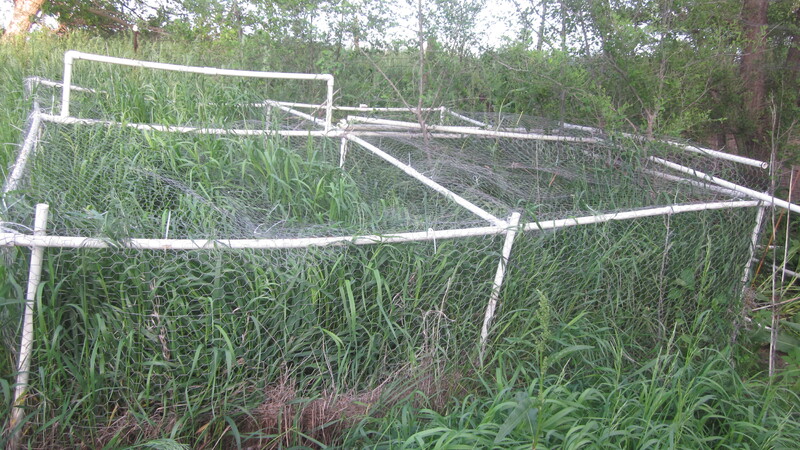 I am so thankful for my folks, Carrie, and I’ve been out today in the wind cleaning up that chick enclosure. We’ve actually had rain during the past two weeks, and so the brome grass is really getting tall! Hey, Amy! I know you haven’t heard from me in ages, but I caught a glimpse of your blog post title on Facebook and I had to read what you wrote about today. I only have four Rhode Island Red hens that we’re preparing to place in a chicken coop here in about a week or so and they are the messiest girls EVER! All they do is eat and poop, eat and poop and EAT, EAT, EAT. 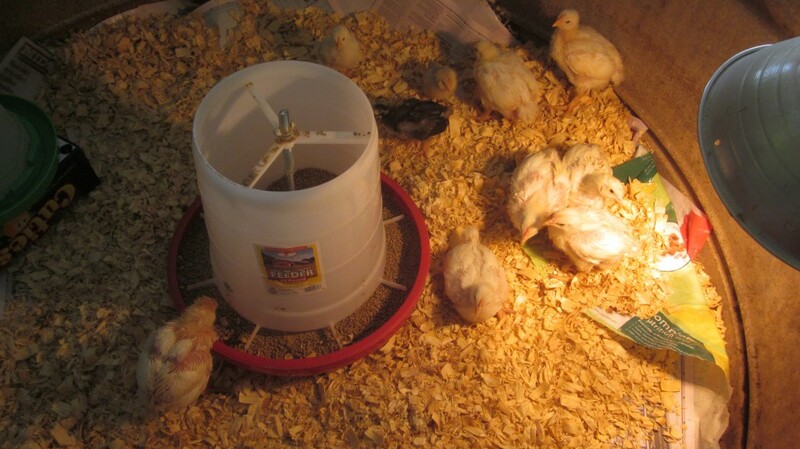 They are just over five weeks old and they have grown accustomed to me taking care of their basic needs. And, yes, that includes cleaning their cage that they are housed in. I never thought of joining boxes together to make them a “hallway” to run around in. That’s so cool! It’s nice to hear from you! I didn’t know you raised chickens! Aren’t chickens fun? But you are right, they’re messy! I enjoy hearing about your experiences. Actually, Amy, this is our first time with having chickens since I was a kid. We had them everywhere when I was growing up on a farm. They’ve actually calmed down considerably over the past 48 hours. They’re enjoying their time outside today…in their temporary home, of course! Awwww…. 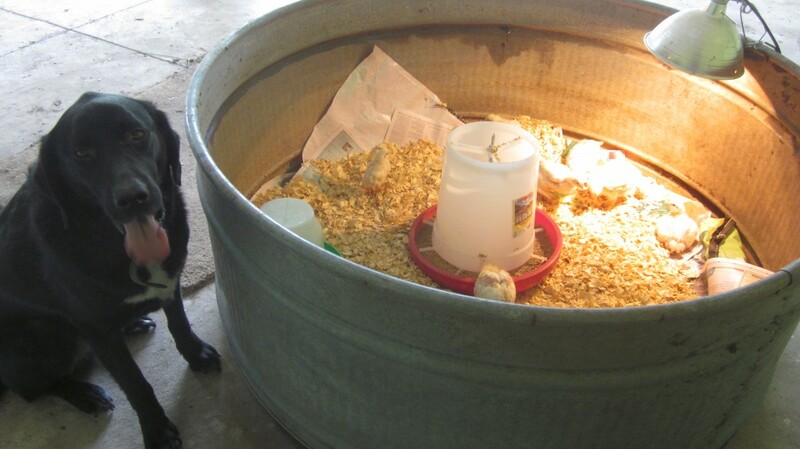 those little chicks are so cute. One would never guess that they could make such a stink! I’m so glad you found a solution, so you can get some rest! Samantha, I always remind myself of how great that manure is for my compost pile and, ultimately, my garden, and it doesn’t bother me so much after that . . .
Cuties! Wish they didn’t smell so badly. Good that you’ve found a solution for them, though! Thank you Sheri. I’m sure everybody could probably do without the vivid smell . . . I sure could! We were just putting together a video montage of animals and I thought of your cornish cuties:) Thanks for the update! Wondering if the stock tank to the pen move will be shocking (temperature-wise)? An for certain – VERY cute. I won’t move the babies ouside until they are fully feathered and the nights are a bit warmer, don’t worry! They have quite a bit of space in the stock tank, and they’re happy for now in the garage!